We love our Treat Receipt – a chance for us to give a little something to our fab customers who join us bright and early each morning! How does it work? It’s really simple. All customers joining us before 9.30 each morning, eat in our take out, get one of our ‘Treat Receipts’. 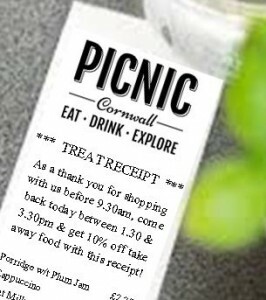 Every Treat Receipt entitles the holder to 10% off our yummy take out food later during the day – a scrumptious sandwich, a Cornish pasty, or a slice of something decadent maybe – the choice is yours!